This pass is good for a total of one year from the original date of purchase. 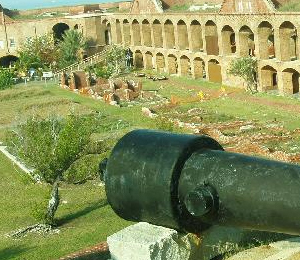 The cost is $50 and it is valid in all national parks including the Dry Tortugas National Park. About 80% of the costs of the pass help to support a variety of projects including preservation and conservation efforts in various national parks. If the national park charges visitors in a "per vehicle" basis, the National Parks Pass admits the Pass holder, as well as accompanying passengers so far as the vehicle is a private, non-commercial vehicle. If the park charges on a "per person" basis, the Pass will get the Pass holder in, as well as the holder's spouse, children and parents. The Pass is usually only an entrance pass, meaning other fees associated with park activities such as camping, parking, tours and concessions are typically not covered or reduced by the Pass. The Golden Eagle pass is an addition to the National Parks Pass that will get you into all national parks as well as federal recreation areas including sites that are managed by the U.S. Fish and Wildlife Services, the U.S. Forest Service, and the Bureau of Land Management. Like with the National Parks Pass, the Golden Eagle Pass will be good for the pass holder and any accompanying passengers if the park or recreation area charges a "per vehicle" fee (so long as the vehicle is a private and not commercial vehicle). If the park charges on a "per person" basis, the Pass holder as well as their spouse, children, and parents can enter the area free of charge. Also like the regular National Parks Pass, the Golden Eagle Pass typically only covers entrance into the parks and not other fees or charges such as fees associated with camping, parking, or tours. The Golden Age Pass is only available for people over the age of 62. Unlike the National Parks and Golden Eagle Passes, the Golden Age Pass is a lifetime pass that will get holders into national parks, monuments, historic sites, recreation areas, and national wildlife refuges free of charge. At "per vehicle" parks, the Pass allows the holder and accompanying passengers in a private vehicle to get into the park. At "per person" parks, the holder as well as their spouse and children are allowed entrance.The pass can be obtained in person at a federal area that sells the passes. Only U.S. citizens and permanent residents qualify for the pass. Proof of age much be shown upon obtaining your pass. Obtaining the pass requires a $10 processing fee. Unlike the National Park Pass and the Golden Eagle Pass, the Golden Age pass allows its holders to receive a 50% discount on most of other fees and charges associated with national parks in addition to the entrance fee. This includes camping, parking, boat launching, and tours. In most cases, only the actual Pass holder can receive this discount. The Golden Access Pass is available to US citizens or permanent residents who have a permanent disability. This is a lifetime entrance pass to all national parks, monuments, historic sites, recreation areas and national wildlife refuges. Like the National Parks Pass, the Golden Access Pass allows the holder and accompanying passengers entrance to the parks and areas so long as the vehicle is private and not commercial. At areas that charge on a "per person" basis, the Pass holder and their spouse and children are allowed entrance. Holders of the Golden Access Pass can also receive a 50% discount on different fees and charges associated with national parks in addition to the entrance fee. This includes camping, swimming, parking, and tours. Typically, only the holder themselves can receive the 50% discount. A Golden Access Pass can be obtained in person. It is only available to people who are US citizens or permanent residents who can show proof of a medically-determined permanent disability.